The view from above the Delta IV Medium rocket carrying the U.S. military's WGS-8 satellite. Delta IV is an expendable rocket that performs launch services for the U.S. government, for the most part – mainly for satellites flown by the Department of Defense or the National Reconnaissance Office. A notable exception was the 2014 test of the Orion spacecraft (Exploration Flight Test 1) aboard a Delta IV Heavy; the flight was designed to test a spacecraft expected to bring astronauts beyond Earth orbit to deep-space destinations. A Delta IV Heavy will also launch the Parker Solar Probe in 2018, to collect data from nearby the sun. McDonnell-Douglas, which later became part of Boeing, designed the Delta IV, and today it is manufactured by United Launch Alliance. It launches from two locations: Cape Canaveral Air Force Station in Florida and Vandenberg Air Force Base in California. The Delta IV comes in three configurations: the Delta IV Medium, three variants of the Delta IV Medium-Plus and the Delta IV Heavy. The rocket types also can have variations in their payload fairings and propellant types, depending on the configuration. The Delta IV Medium has a large core booster first stage and a Delta III second stage that is 13 feet (4 m) in diameter. The last flight of the Delta IV Medium took place in November 2006. The Delta IV-Medium+ comes in different sizes and uses various configurations of strap-on boosters to increase its payload capacity. It has three variants. The Delta IV M+(4,2) uses a 13-foot payload fairing, a 13-foot-diameter second stage, and 2 strap-on solid rocket motors. The Delta IV M+(5,2) uses a 16.5-foot (5 m) payload fairing, a five-meter-diameter-second stage and 2 strap-on solid rocket motors. The Delta IV M+(5,4) uses a five-meter payload fairing, a five-meter-diameter second stage and four solid rocket motors. The Delta IV Heavy uses two additional core booster stages for extra lift, replacing the strap-on boosters. "Delta IV rockets can accommodate single or multiple payloads on the same mission," Boeing wrote on an old page about the Delta IV, which is available at archive.org. 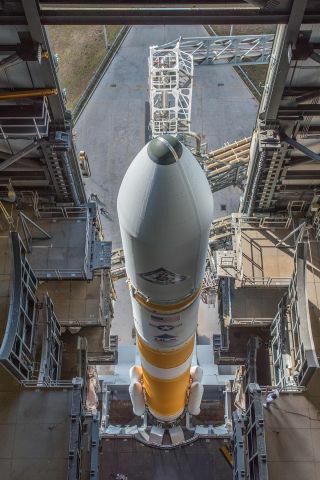 "Delta IV rockets also can launch satellites to polar orbits, Sun-synchronous orbits, and the International Space Station orbit," Boeing added. A United Launch Alliance Delta IV-Heavy rocket lifts off from Space Launch Complex 37B at Cape Canaveral Air Force Station, Fla. The first Delta IV launch – specifically, the M+(4,2) variant – took place on Nov. 20, 2002, from Cape Canaveral Air Force Station in Florida. Its payload was the Eutelsat W5 communications satellite, which was deployed successfully. The first Delta IV Heavy launch took place on Dec. 21, 2004, and resulted in a partial failure. The demonstration main payload, called DemoSat, did not reach its intended orbit because the core booster stage cut off early. Two smaller satellites called 3CS-1 and 3CS-2 failed to reach orbit altogether. The first Delta IV launch from Vandenberg took place on June 28, 2006, using a M+(4,2) variant. It successfully placed a reconnaissance satellite into orbit. The first Delta IV Heavy launch from Vandenberg happened almost five years later, on Jan. 20, 2011, and put a reconnaissance satellite into orbit. A notable partial failure took place on Oct. 4, 2012, during the launch of a GPS satellite called IIF-3. The Delta IV M+ (4,2) rocket that launched the satellite had a fuel leak in the upper stage, which caused lower thrust than expected. However, the rocket had enough fuel to put the satellite into its expected orbit. An investigation into the matter was conducted. ULA successfully launched GPS IIF-4 in May 2013 (using an Atlas V rocket). The next satellite in the series, GPS II-5, launched successfully on a Delta IV M+ rocket in February 2014. Since then, a combination of Delta IV M+ rockets and Atlas V rockets have launched the rest of the series, with the last launch (GPS IIF-12) taking place in February 2016. The Delta IV Heavy lofted an uncrewed Orion spacecraft into space on Dec. 5, 2014. The spacecraft's flight marked the first time that a capsule designed for humans went beyond low-Earth orbit since the Apollo 17 moon-bound mission of December 1972. Around three hours after launch, the second stage of the Delta IV Heavy rocket pushed Orion to an altitude of 3,600 miles (5,793 km), which is about 14 times higher than the orbit of the International Space Station. Orion came back to Earth at a high speed, testing its heat shield, and successfully splashed down in the ocean as planned. In 2015, United Launch Alliance announced plans to retire the Delta IV Medium configurations in 2018 or 2019, due to its increased cost compared to the competition, according to SpaceFlight Insider. At the time, the company said it planned to replace the Delta IV with another launch vehicle, called Vulcan. The Delta IV Heavy will remain in service for the time being, however. The last flight of the Delta IV M+(5,2) variant took place on Jan. 12, 2018, during a successful launch that saw a reconnaissance satellite placed into low Earth orbit. The Parker Solar Probe will launch no earlier than July 31, 2018, aboard a Delta IV Heavy. The probe will perform seven flybys of Venus to make its orbit closer and closer to the sun, until it is inside Mercury's orbit and at a planned closest approach of 4 million miles (6.4 million km). Its goal is to provide better forecasts of the sun's activity.